There are better-sounding multiband exciters, but Vitamin's easy controls and processes make it one to check out. Decent sound. Dry level knob. Simple controls. Per-band stereo width. Zero-latency for live use. Affordable. Can sound harsh if pushed. Unlike a conventional harmonic enhancer, Waves' new 'Sonic Enhancer' plugin, Vitamin (VST/AU/RTAS/AAX), is built on an effects chain comprising multiband EQ, compressor, saturator and stereo imager, but with a highly simplified interface that combines multiple calibrated processes within each of its controls. It separates the input signal into five configurable bands, each one centring on a big slider that raises and lowers the amount of saturation, EQ and compression. Bandwidths are set using the display above the sliders, which also shows response curves and gives a coloured spectrum-analyser-style display of the frequencies being added. "Each band includes a very useful stereo width processor that's particularly handy for narrowing bass content"
Bands can also be disabled and soloed for fine-tuning, and the solo function actually makes for a very effective filter. Additionally, each band includes a very useful stereo width processor that's particularly handy for narrowing bass content. Although Waves isn't specific about what's really going on under the hood, it sounds to us like the EQ, saturation and compression levels are controlled by the sliders, while the stereo width of each band is controlled separately. Vitamin is an additive effect, so it's essential to avoid overloading the internal sections or the output stage, to which end it includes stereo input as well as output meters, and gain controls. There's also a Direct control for setting the amount of dry signal mixed in, offering more flexibility than a simple wet/dry mix pot. Another clever touch is the Master controls for stereo width and band boost, enabling you to move those two parameters up or down for all bands, maintaining their relative offsets. In effect, these function as global 'amount' knobs, for increasing or reducing the overall effect once you've set your desired balance. Finally, the global Punch control applies accentuating or smoothing of transients as harmonics are added. It's a worthy inclusion but, like Vitamin in general, quite a blunt instrument. The simplicity of Vitamin's controls results in an immediate impact when applied heavily. It's very satisfying at first but can result in over- compression and loss of clarity if not handled with care - although it looks like a regular exciter, it isn't really meant to be used like one. Indeed, while the sounds it makes are quite nice, some producers will still prefer to apply the individual processes offered by Vitamin separately. This confluence of effects probably also explains why boosting with it can sound a little harsh compared to other multiband exciters. Still, with Vitamin, Waves have taken their knowledge from their producer/engineer- branded Signature Series plugins - which also combine multiple effects in streamlined interfaces - and made a fine fist of applying it to the enhancer/exciter concept. Just like the Signature Series, it facilitates the quick and easy harnessing of a complex array of processes via straightforward controls to get usable results quickly and easily. In this respect, it's a success and should appeal to the same target audience of beginners and electronic music producers, for whom speed and simplicity are key. 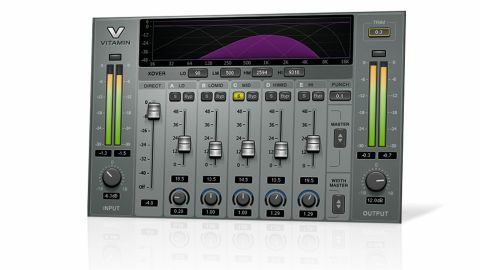 In short, we don't expect to see Vitamin finding a home in many professional studios, but it certainly deserves to be on the radar of anyone looking for a very easy-to-use, broadly effective mixing tool at a fair price.